​Thrashing, violent, swirling winds rip and pull at nature, tug at your clothes and sting your eyes. Mountains of earth have been swept up creating a living breathing wall of dust rolling across the land, engulfing everything that it touches in an eerie haze where time slows and the world around melts away. Much like finding yourself in the eye of storm everything is deafeningly silent and oddly peaceful, you are isolated and surrounded all at once. Like everything does, this moment will pass. The wind will keep blowing and move on until it slowly dies out and fades away. While you can you embrace the moment, experience the wonder of nature, connect with the earth swirling around you and disconnect from all your distractions. Even if for only a short moment, you are one with nature. In her powerful forceful way nature has boldly announced Monsoon season is here. Buckle up and enjoy the powerful, refreshing ride that is to come. 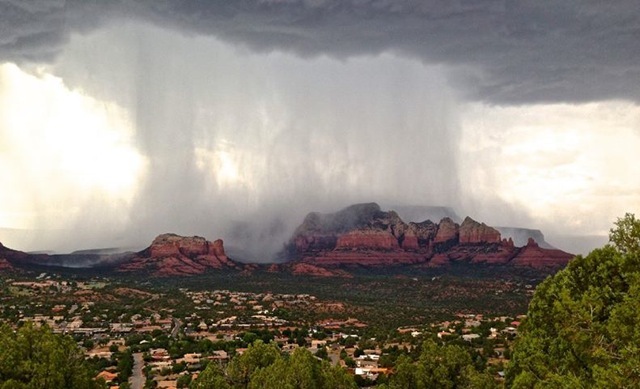 Monsoon season has a special place in my heart. It leaves me in awe at the power and wonder of nature and gives me a deeper feeling of connection. This is a perfect time to embrace the wild unpredictability of the season. Throw your doors open, let yourself free and dance in the rain. Feel the rain hit your face as it drenches and replenishes the earth. Watch the plants thrive and bloom with new vitality. 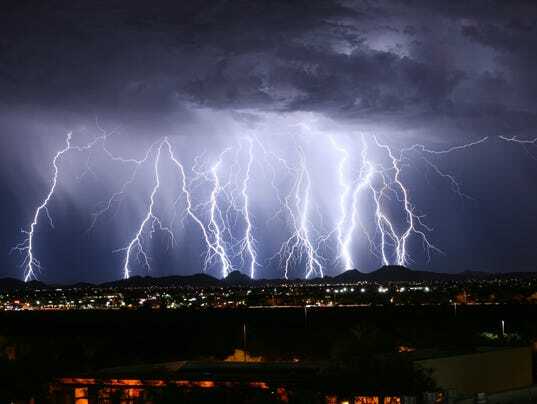 Stand in awe at the amazing, breath taking and startling light and sound shows that dance across the sky. How can you make the most of this powerful time of year? How can you embrace the spirit and energy of the season? There are many ways to go about doing it and ultimately you have to trust your instincts, guidance and gut. To get you started though here are my 5 tried and true steps to embracing the Monsoon season. Disconnect from technology (we don’t want it to get wet anyways) and step outside. Calm your breathing, clear your mind and open your ears. Listen to the wind whistling in the trees, to the plants swaying and bending to nature’s will. Hear the steady drumming of the rain as it pours from the sky or the quiet pitter patter splat as it slows and drifts away. The heart stopping boom and roar of thunder. Let the sounds of nature surround you and drown out the world. Close your eyes and turn your face up to the sky. Feel the cool rain roll down your face. Take off your shoes and squish the damp earth between your toes, run through the rain slicked grass. Reach out and feel the energy sizzle as the lightning strikes. Open your senses. Smell the damp wet earth as life is poured back into it with every rain drop. Absorb the crisp scent of the wind blowing past your face, the tang of energy just before the lightning illuminates the sky. 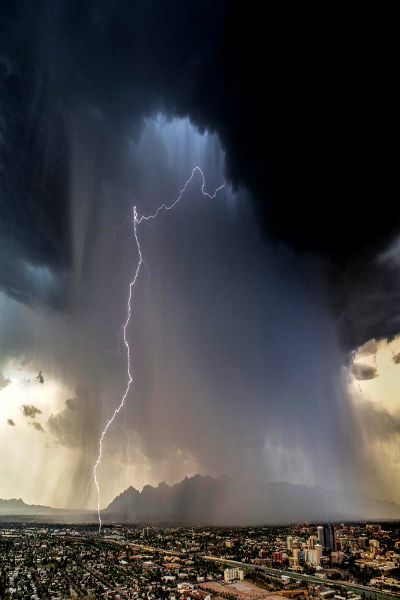 With your senses open and in tune with the changes the Monsoon is bringing, focus beyond the physical body. Open your emotions and your spirit to the energy and power swirling around. Ground yourself to the earth and carry yourself away with the wind. Spin, swirl and dance to the beat of the rain syncing your energy flow to the rhythm of the storm. Let the rain wash over you flushing away the negative, the unnecessary, the worrisome and stressful. Let the water leave you revitalized having poured the energy of nature itself into your soul. Embrace the power of nature. Leave yourself refreshed, revitalized and new. Become in tune with the world around you and let your wild spirit free. Enjoy the monsoon while it is here and let it leave you ready to bloom. 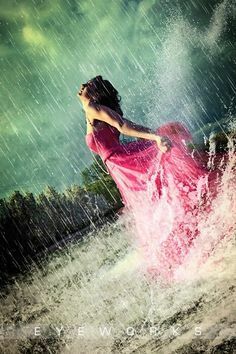 Come join me and dance for the joy of it, arms flung wide open, swirling, spinning and laughing in the pouring rain. Listening and appreciating the nature is sometimes the best thing to do while the monsoon season is in your place. The blogger was right, this kind of season is only happening just for a short while, so don’t miss the experience of having it. Enjoy the weather you are experiencing right now, be happy because you are witnessing it and be thankful because you are feeling it. But be careful sometimes nature could be mischievous, you do not know what will happen next. This is a very interesting blog and I am looking forward to your other posts.